Joel Berger, PhD - Conservation Heroes - Banovich Wildscapes Foundation, nonprofit (501c3) organization fostering cooperative efforts to conserve the earth's wildlife and wild places benefiting the wildlife and the people that live there. MUSK OX-Two of the research subjects on Wrangel Island. Approaching the musk oxen dressed as a polar bear. The white gloves designed for the costume weren't thick enough to handle the cold, so Berger was forced to wear a thicker red option. The location of Wrangel Island in the Arctic. Joel Berger-Northern lights over the camp on Wrangel Island. The Indianapolis Prize is given every other year to an individual who has made extraordinary contributions to conservation efforts involving a single animal species or multiple species. 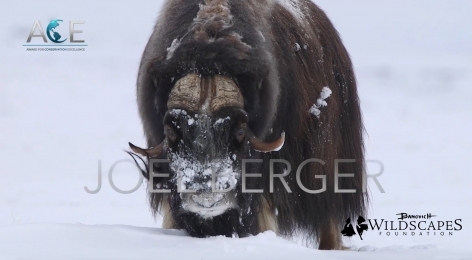 Muskoxen are not the only charismatic creatures perfectly suited to the wind-blasted, tundra of the Alaskan Arctic. Meet Joel Berger, Wildlife Conservation Society senior scientist, Colorado State University professor—as well as expert on hoofed mammals. 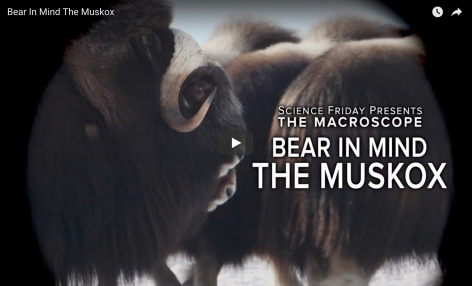 In addition to gathering photos to track how fast muskoxen are growing, Berger conducts a seemingly hazardous test: He dresses up as a grizzly bear, approaches the herd, and gauges their reactions. Berger uses this unusual technique to find out whether the presence of more male oxen makes the herd safer from bears.